Was hanging out at Baker Place taking photos last night. 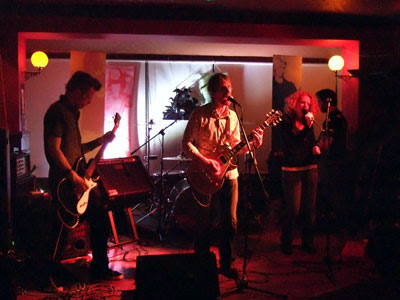 The reason was the debut of Susannah Clare singing live with The Fewer The Better. She came up on stage for the song "Angela's Alright", harmonising with Jim Griffin. Susannah recorded the same song with the lads for their new album, which should be out any time now! Some very loud rock was going down all evening, with Sea Dog and Tina Turbo adding some notches to their "killed by volume" tally. On a less positive note, the managers at Baker Place have moved all of the gigs from the cool and grungy Underground to the pub upstairs, where, until 9:30 on this particular night, the regulars were more interested in the friendly match with Argentina than anything approximating music. The move seems like a bad idea all around. More photos (in a nifty slideshow) on Susannah Clare's MySpace page. Yea - gotta agree it's a stupid move to have gigs up there. Good gig but sound is impossible to get right up there. Should start a "Bring Back The Underground!" movement!! !